Raven in a Dove House by Andrea Davis Pinkney. Review: Imagine that you are at your aunt's house. You are watching the food, making sure it doesn't burn. Your cousin and his friend call you upstairs in the attic. When you go upstairs, they give you something very unexpected. That is just a part of the book Raven In a Dove House by Andrea Davis Pinkney. 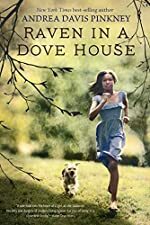 In Raven In A Dove House, Nell was just a regular 12-year-old going to her aunt's house for the summer. She is happy that she was going to her aunt's house since she will be away from Brenda, her dad's girlfriend. Nell finally reaches her aunt's house, and after a few goodbyes, they finally went inside. Nell met her cousin, Foley, and his friend, Slade. One day, Nell was watching the food, making sure that it won't burn. Slade and Foley were in the attic counting worms. All of a sudden they both called Nell up stairs. Nell went upstairs, and Slade gave her something called a raven .25. They told her put it in her dollhouse. All of a sudden Nell doesn't trust anyone. She doesn't even trust herself! Will Nell trust anyone or herself ever again? Andrea Davis Pinkney's writing will keep you glued to the book! You won't be able to stop turning pages because of all the events in the book. In my opinion, Raven in a Dove House is probably for ages 10 and older because in some scenes it feels like two people are flirting. There is also a weapon in the book, which probably wouldn't be appropriate for younger readers to read. The vocabulary in this book isn't complicated, although there is dialect. This book is good for both boys and girls. It would be good for a boy because most boys would like the fact that the narrative includes a weapon. There are also boy characters in the story, so there are many boy activities in the book. The book is good for girls because it is told from a girl's point of view, and there are events in the book that girls would like. I liked that this book was written in first person point of view so the narrator's feelings are explained more. Overall, Raven in a Dove House is a very good book. Review written by Sabeen (6th grade student). Have you read Raven in a Dove House? How would you rate it?